It’s important to measure success, make improvements and measure again if you want to be successful as an app developer. Like any other business venture, you don’t just launch an app and move on to the next one. You have to track performance, measure return on investment, and use data to inform decisions and make enhancements. How do you do that? With the data available to you, to help you understand how users interact with your app and reasons why they interact in those ways, as well as whether the app is making money. However, also like any business venture, there is a lot of data, a lot of metrics, and a lot of acronyms (DAU, MAU and others) that can make it seem overwhelming and confusing. We’re here to help. Let’s take a look at the most essential app metrics to measure success. The first measure of success for an app is how many people actually download and intend to use the app. This is your initial look at user engagement since your first goal should be to achieve a broad user base. You should also track the source of the installation, as it can help inform decisions about future channels for advertising and future marketing efforts. You can even track downloads on a daily basis to provide insight into the impact of any marketing campaigns. Related to this, you should also monitor the activation rate. This is the percentage of people who downloaded the app who actually launch it for use. Google Play store and Apple App store can provide reports on this metric. 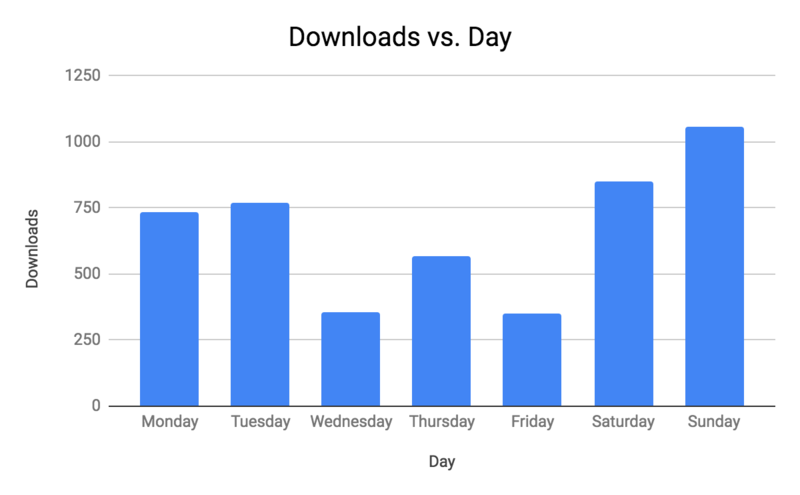 You can easily build a “Downloads per day” chart with the help of Supermetrics Google Sheets Add-on. This chart allows management to easily get an understanding of what day of the week is the most popular for app downloads. Knowing how many people have downloaded your app doesn’t necessarily tell you how many are using it. Active engagement is important to track, and there are a couple of metrics you can use to track the actual active users of your app. First, there’s Daily Active Users (DAU). This number will tell you whether people are using the app and how many people find your app indispensable. 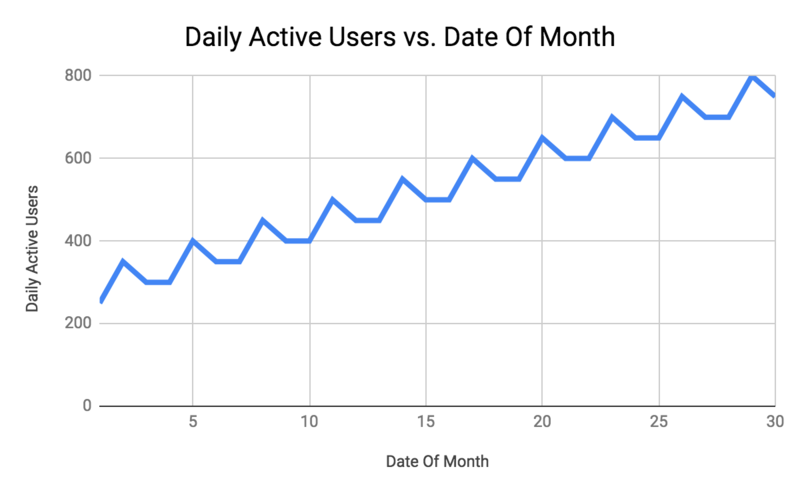 The chart below was built with Supermetrics for Google Sheets and it shows the progression of Daily Active Users across the period of a month. The metric tells you each individual using the app, not the number of sessions. So each person is counted once, whether they use the app once a day or many times a day. DAU can also be calculated for a specific day or be averaged over a specific timeframe. DAU then is calculated by looking at a number of users who opened the app in a day. Another user metric is monthly active users (MAU), which is the unique number of people who use the app over the course of a specific month, or the prior 30 days. For instance, if the app has been used 20,000 times, in the last 30 days, by 10,000 people, the MAU is 10,000. Tracking those who regularly open and engage with the app shows you the usefulness of your app. To do this, you can use Google Analytics, which classifies an active user as somebody who has opened and interacted with your app in the last 30 days. It will even break it down into four segments: 1-day, 7-day, 14-day, and 30-day active users. These are unique users who opened sessions on the app over the timeframe selected. You can also use DAU and MAU numbers to calculate “stickiness” – defined as how often people come back to the app. To determine this amount, divide DAU by MAU to get a percentage. The higher this percentage is, the more often users return to use the app, and if the percentage increases over time, that’s even better. The closer the number of DAU is to the number of MAU, the higher the “stickiness” of the app. It means your monthly average users are coming back more often. This is another important metric to keep an eye on, as it will tell you how many people are returning to your app. There are a few different retention formulas you can look at, but the most valuable would be the percentage of users that return to your app in a period of time, such as month to month. For instance, you could calculate the number of users in a specific group who used your app in July compared to that same group who used it in June, the month previous. This will give you a monthly retention rate, and help determine if your app’s onboarding of new users, messaging, and user experience is keeping people active on the app. 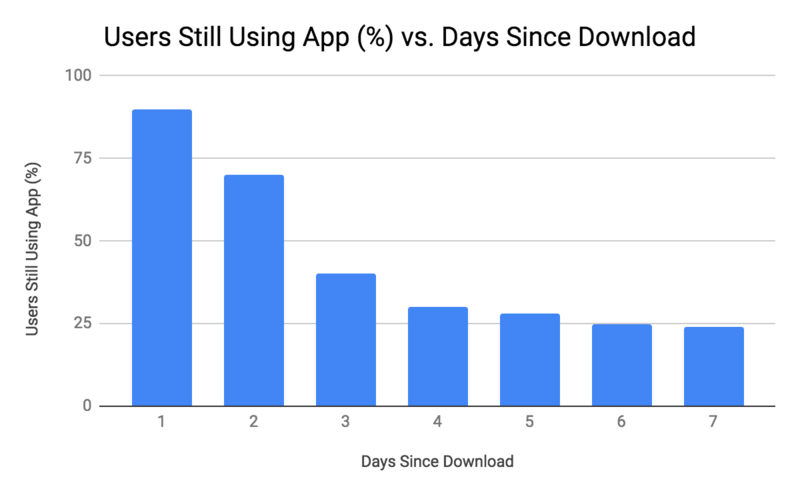 You can monitor this percentage of users that return to your app over each 30-day timeframe to examine retention. This can become as important a metric as user acquisition since there is no cost to acquiring these return users. Somewhat related to retention is cohort analysis. This is a way to analyze when people are “dropping off” in their usage of your app. People tend to download a lot of apps and use some of them. You can improve retention and create long-term users by knowing when – and therefore why – people quit using your app. This is another key metric, as it tells you how much value each of your customers is bringing to the app. To provide you with a valid comparison, start by calculating your Cost Per Acquisition (CPA). This is calculated simply by dividing the total costs of your app campaign by the number of acquisitions the campaign produced. Lifetime value (LTV) is targeted at calculating how much value to expect from an average customer during the time they are customers of your app. This can be revenue or profit and can be before marketing costs are applied or after. It’s important to determine that in advance so the calculations are consistent. It’s also key that your LTV is great than CPA, or you’ll be operating in the red. How often users make transactions. The monetary value of those transactions. How long customers usually stay as customers. Since this is an average, it will include those you lose early and those who are loyal and stay with you. This calculation tells you whether customers are bringing value to your company. You’ll know whether you’re getting a good deal on customers, or paying too much for them. Here’s a final metric you may want to track. After all, like any business, the rating received by customers is an important component to keep an eye on. Your app’s star rating is easy enough to track and can drive subsequent conversions. People usually check the ratings before downloading an app. As in any business venture, it’s important to measure the performance of your app so that you can make adjustments and have the right data to make informed decisions. It’s also important to focus on those metrics that are most important to your success. Depending on the goals you’ve established for your venture, these metrics will be key ones to focus on and track as you continue to improve your app and build a loyal user base. 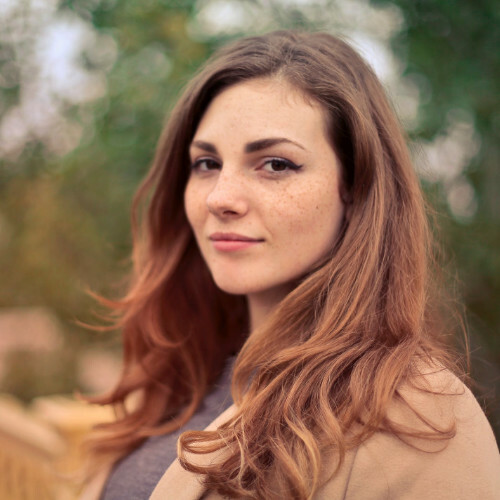 Danielle is part of the content marketing team at Pyramid Analytics. They provide enterprise-level analytics and business intelligence software. In her spare time, she writes around the web to spread her knowledge of marketing, business intelligence, and analytics industries.